Smart Defrag - FREE Defragment Tool Automatically Speeds up Computer in Minutes. 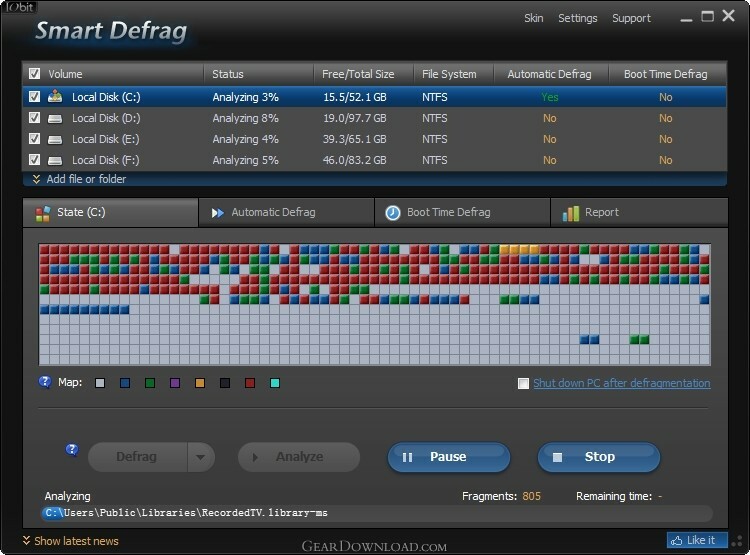 Smart Defrag is a safe, stable and easy-to-use disk defragmenter that provides you maximum hard disk performance automatically and intelligently. With the new generation of ultra-fast defrag engine, Smart Defrag 5 can not only defragment your HDD but also trim your SSD to accelerate disk read/write speed and enhance disk durability. You can easily defrag large files and consolidate free spaces with the newly added Large File Defrag and Free Space Defrag for more efficient defragmentation. Also, you can enjoy top game experience with Game Optimize in Smart Defrag 5. + Supported automatically shutting down PC after a scheduled defrag. + Improved defrag engine to defrag large files faster and more effectively. + Optimized work process for a better user experience. What's New: + Supported automatically shutting down PC after a scheduled defrag. + Improved defrag engine to defrag large files faster and more effectively. + Optimized work process for a better user experience. + Updated multiple languages. * Fixed all known bugs. This download (smart-defrag-setup.exe) was tested thoroughly and was found 100% clean. Click "Report Spyware" link on the top if you found this software contains any form of malware, including but not limited to: spyware, viruses, trojans and backdoors. Smart Defrag Server 2010 Trial 1.45 - Automatically defrag server disk. Optimize server disk in Minutes. IObit Unlocker 1.1 - Unlock files or folders on desktop.